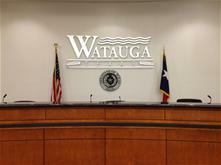 The Watauga Municipal Court is organized into two divisions, the Judiciary and Administration. The function of the Judiciary is to conduct business separate and independent of the other two branches of government, and to providing fair and impartial justice to the citizens of Watauga. The duty of the Administration division is to support the Judiciary by assisting the public with experience and patience and by managing court operations proficiently. Nothing contained within this website is intended to be interpreted as legal advice. Notice to Jurors: Please bring your juror information sheet filled out and expect to serve only 1 day. Most jury trials last about 4 hours, but 8 hours is the maximum required service.